Millions of people around the world are diagnosed with diabetes and not everyone has the same type of diabetes. There are several types of diabetes, some more frequent, some less. It’s very important to know the differences between these different types, especially if you have a love one who has been diagnosed or to get educated just in case you know someone who has complications from this disease. Three main types of diabetes that one can be diagnosed with. Millions of children and adults in America have been diagnosed with type 1 diabetes (also known as juvenile diabetes). Type 1 diabetes is a lifelong disease that happens when the body’s pancreas is unable to produce insulin to control blood sugar (glucose) levels. Because it is a disorder of the body’s immune system, it affects the body from protecting itself from viruses, bacteria and other foreign substances, thus it is a dangerous disorder. Diabetes is a chronic disease for which there is no cure. When the body’s immune system attacks and destroy beta cells in the pancreas. Beta cells are essential in producing insulin, a hormone that helps the body move the glucose contained in food to the cells which is then converted to energy. But because the body is destroying the beta cells, it prevents the body from creating insulin and instead of glucose going into the cells, glucose stays in the blood and without any treatment, this can lead to serious damage to the body’s organs. Symptoms of type 1 juvenile diabetes includes extreme hunger, extreme thirst, frequent urination, drowsiness or being lethargic, changes in vision, wounds or sores that heal slowly, having dry or itchy skin, losing feeling in the feet or having tingling I the feet, rapid weight loss and a sweet or wine-like odor in the breath and difficulties breathing. Type 2 Diabetes, the most common form of diabetes, is a hetereogenous disorder that incorporates three basic metabolic defects which include a resistance to insulin, a defect of the body’s inability to secrete insulin and an increase in glucose production in the liver. What causes this is yet unknown but research into the natural history of type-2 diabetes have shown that it is common among ethnic minority groups such as Latinos, African Americans, Asians and American Indians. It is known that the disease can be genetic but lifestyle factors such as obesity, high blood pressure and a poor diet and can lead to significant problems in the body. According to studies, people who suffer from type 2 diabetes are like to suffer cardiovascular disease. But unlike type 1 diabetes, some have treated their disease by dietary changes, exercise or the use of treatment via tablets and for some, via insulin injections. Symptoms of type 2 diabetes develop gradually and are not as immediate as type 1 diabetes. Symptoms include fatigue, nausea, frequent urination, extreme thirst, weight loss, blurred vision, frequent infections, slow healing wounds and sores. For some, type 2 diabetics, they have no symptoms. Gestational diabetes (either type 1 or type 2) happens during pregnancy and studies have shown that it occurs among women who have a family history of diabetes or their body has poor glucose control during pregnancy. It most often in African Americans, American Indians and Latinos. 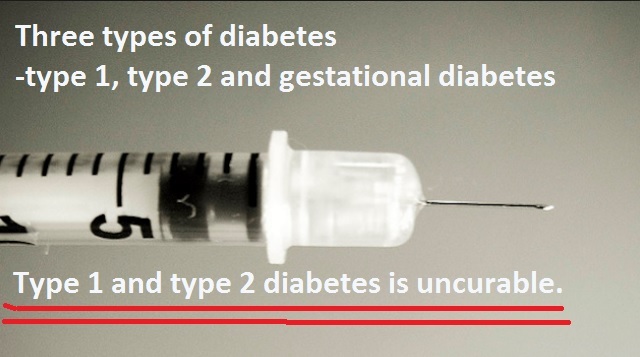 Women who have been diagnosed with gestational diabetes have a 20 to 50% chance of developing type 2 diabetes within 5-10 years but it is very important to be diagnosed because infants are at risk of miscarriage and developing congenital abnormalities.